My Southern Sparkle: Happy 3 Months until Christmas! Happy 3 Months until Christmas! Yes! It is only 3 months until Christmas!!! How are you doing on your preparations? I got started this week and one gift is taken care of. It feels good to make some progress and know that is one less stress for closer to the big day! 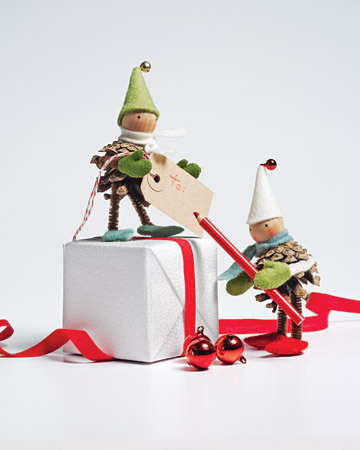 Also, I looked at Martha Stewart's Christmas Craft ideas and saw these adorable little pinecone guys. Aren't they just the cutest? Check out the link above, I am sure you will find something that wil get you exited about getting a jump on the season. I do love to do holiday crafts but find if I wait until the seson arrives there is never time to do them, so I love seeing all thise ideas early. So, y'all.....3 months! 3 MONTHS! I can't believe it is that close. It seems to take forever. I got a gift while on vacation. And hoping to get some in the next 2 weeks so I can get a package shipped off to Tokyo by the beginning of November. I must admit, I am not prepared whatsoever. I'm still dragging the autumn boxes upstairs. Oh how I wish I were ready for Christmas. So cute! I have tons of pinecones in my yard. Might have to work on these! Happy Fall Inspiration from Friends!